This flavorful vegetarian stew will help you use up your late-summer vegetables. Ratatouille is one of the first dishes I learned to make. Though there are many debates about the right ways and wrong ways to prepare this Provençal dish, what stays the same is the use of late-summer vegetables. Instead of the usual sweet peppers, here I use dried anchos, which have a fruity, earthy and ever-so-slightly smoky, spicy flavor. 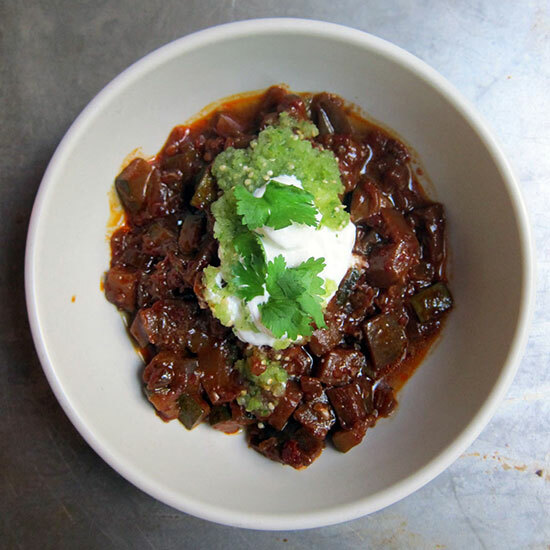 To continue with the Mexican theme, I season the dish with cumin and oregano, and then serve it like a chili, with sour cream and salsa verde (store-bought is fine!). This is one vegetarian dish you can pair with a full-bodied red wine. Just look for one that isn’t too tannic. 1. Using a box grater set in a bowl, carefully grate the cut sides of the tomato halves, stopping when you reach the skin. You should have about 1 cup of puree. 2. In a heatproof measuring cup, cover the ancho chiles with boiling water and let stand until softened, about 20 minutes. Stem and seed the chiles and transfer the flesh to a food processor or blender; add 1 cup of the soaking liquid and puree. 3. Meanwhile, heat the olive oil. Add the onions and garlic, season with salt and pepper and cook over moderate heat, stirring occasionally, until very soft, about 10 minutes. Add the zucchini and eggplant and cook until they start to soften, about 10 minutes. Add the cumin and oregano and cook until fragrant, about 1 minute. Add the tomato and ancho purees and cook over moderate heat until the eggplant and zucchini are tender and the sauce is thickened like a chili, 10 to 15 minutes. 4. Transfer the stew to bowls, garnish with sour cream, salsa verde and cilantro leaves and serve. One serving 384 cal, 32 gm fat, 6 gm sat fat, 25 gm carb, 9 gm fiber, 6 gm protein. Wine A juicy, fruit-forward Spanish Grenache, such as 2012 Borsao Campo de Borja.